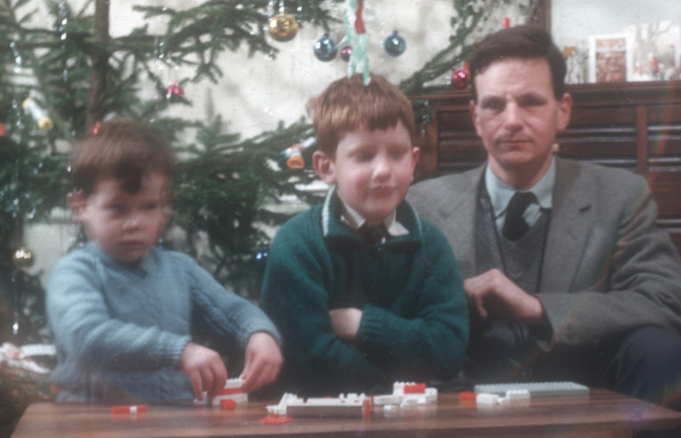 I am the child on the left here, feeling at home in the rented sector, and where my Dad to this day feels at home. In a few days we’ll be celebrating Christmas there again, now with grown up grandchildren. One obvious reason why it felt like home is that it was a secure tenancy, and still is, governed by 1970s Rent Acts. Less tangibly, I wasn’t aware of any loss of status from being a tenant, but that may be because I was still a child. I asked my Dad about this recently, and he mentioned colleagues as having suggested he get on the housing ladder, as far back as the 1950s he implied. There’s some research to be done here, tracking the frequency of use of this term in contemporary sources. What national newspapers have been digitised for this sort of thing? I do remember, though, my best friend at school in 1967, mentioning his parents having a party to celebrate paying off their mortgage. Ours wouldn’t have felt as much like home either if the landlord hadn’t let my parents make changes to the house. I wouldn’t have known what negotiations with the landlord went on, although my Mum told me, with some pride, that on one occasion it was suggested she was a trouble maker. As of now, I think the landlords are very professional, although I suspect others could find something to complain about. ‘Buying your first property’ feels like an essential marker of having become a full member of society, and renters are often seen as not having put roots down where they live, so not quite accepted into community decision making, even if they felt inclined to participate anyway. To suggest to anyone that they should accept the idea of renting while they get on with their lives will, to most people, be offensive. Is owning a house cheaper than renting it? Encouraging people to, quite literally, bet the house on leveraged capital gain is a dangerous wealth accumulation story that politicians would be wise to avoid. Nor are those costs purely financial: how many owner occupiers do you know who seem to spend an inordinate amount of time fixing things or doing DIY? although I suspect he isn’t one of those Middle Englanders who love nothing more than spending time making changes to where they live, and for whom being free to do so, without having to refer to a landlord, is a large part of the ‘utility’ of home ownership. The emails I’ve been involved with are more about the sociology of the rent vs. buy decision, and how “social norms can sustain themselves in defiance of economic rationality as individuals care about social status as well as making money”. To the extent that I too am an economist, I also imagine that people will start choosing to rent, but that may be wishful thinking on my part. It would be better if sociologists were coming up with empirical evidence that this change might be happening. If renting is to become more acceptable, it will also require the normalisation of open ended tenancies, and professional arrangements balancing the interests of tenants and landlords in the maintenance of the properties. In England, according to the 2015-16 English Housing Survey, social housing provides such tenancies for 17% of households. Of the 20% of households in the private rented sector, only a handful will be secure Rent Act controlled tenancies such as my Dad enjoys. The country which stands out here is Germany, where most households rent, overwhelmingly in the private sector, and with open ended tenancies. 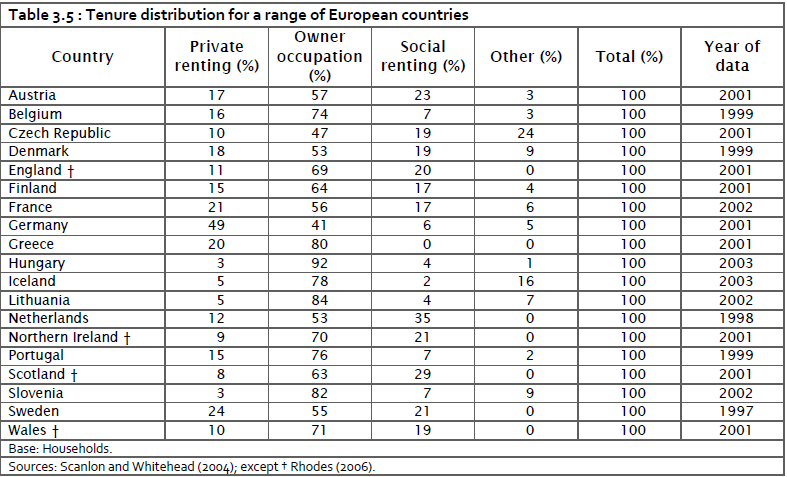 So renting can be the norm, but there are many other countries where renting is even less usual than in England. I think we would do well to become more German, but we shouldn’t think our attitude to home ownership is particularly obsessive. Better would be to understand how the German system meets the human needs of its citizens – for a place to live, which feels like home – without requiring home ownership. In my earlier blog, I mentioned the German Mietspiegel, since when, thanks to John Bibby, Senior Policy Officer at Shelter, I have been able to read this excellent write-up – in English – of how the whole German system works. I hope one day to write more about that, but I believe it explains why open ended tenancies are possible in Germany, making Shelter’s call for merely 3-5 year PRS tenancies unduly cautious, even if a step in the right direction. Unwinding the Housing Crisis: a Which? Landlord? but is again something which it would be good to write more about in due course. Home Sale and Lease back? So, if renting is to be normalised, is there a company with whom I can do a sale and lease back on my home? As a typical baby boomer, like my friend, I am sitting on an appreciable but unrealised capital gains tax free profit on my house, and if I could switch to an arrangement for the next 30 years or so, such as my Dad enjoys still, I might well be interested. It would require thinking through how rents would be set, for as long as I chose to live here and how the property is maintained, in ways which would both I and whoever I sold to could agree on, which would include me insisting on being able to offer a spare room to some younger person. As a thought experiment, it helps focus on what needs to change for renting to be normalised. If baby boomers have led the way in the cult of home ownership, we could also lead its unwinding, incentivised by the CGT tax break on main residential dwellings – as long as that lasts.